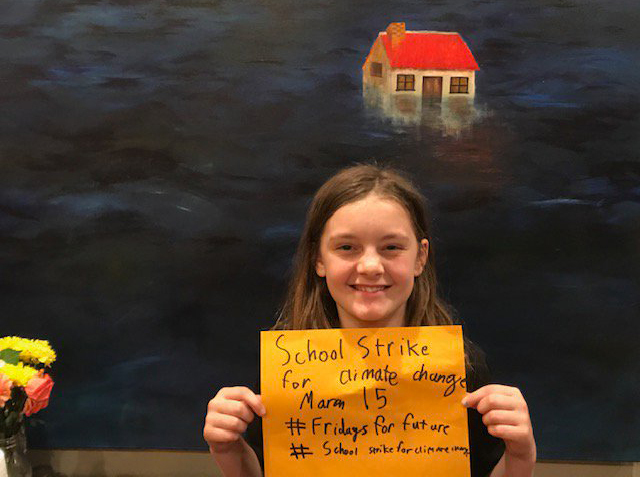 Fifth-grader Juniper Grace is into Greta Thunberg like girls her age used to be into Justin Bieber. Thunberg is the Swedish teenage climate activist whose school walkout to protest inaction on climate change has inspired a global youth movement. Her example turned 11-year-old Juniper into an organizer and the leader of the Berkeley’s Kids’ Climate March on Friday. The action is part of a global youth climate strike, with teenagers and other young people around the world rallying to the cause. Juniper can't say enough about Thunberg. "Greta is really inspiring. She always talks very confidently," she said. "She's just stating how it is." With a little help from her parents and her friends, Juniper has made posters, handed out permission slips, and planned a two-hour walkout and march to Berkeley’s Civic Center on Friday morning. More importantly, Juniper said, she’s talking with her peers about why kids have a special role to play in the fight against climate change, and how they can lobby U.S. politicians to reduce fossil fuel emissions. “I come home from school and immediately answer a bunch of emails and go on Twitter to post an update,” Juniper said, referring to the social media account she set up only last month. Juniper isn’t allowed to have her own cell phone yet, but that hasn't stopped her from becoming a grassroots political organizer. It helps that her parents are fully supportive. Andie Grace said she and her husband are delighted that her grassroots organizing has spread from her school, Washington Elementary, to four other Berkeley schools. “It's super-cool because she's been to protests with us. This is coming from her,” Andie Grace said. While some high schoolers plan to take BART to San Francisco to demonstrate at Congresswoman Nancy Pelosi’s offices, Juniper is content to march to Berkeley’s Civic Center park for two hours and then return to class. “I know there's a lot of other kids who can't get out of class, get on BART and go to San Francisco," she said. "It's important to have small strikes so everyone can take part and understand the issues." Watching Greta Thunberg videos online has inspired her to write and practice her own speech, she said. Juniper sees herself and her entire generation in Thunberg. Her classes don’t involve a lot of public speaking or learning about climate change. So Grace is improvising her own curriculum, becoming a teacher to her peers, and stepping up to lead a movement.